Rome (CNN) - The Sistine Chapel is ready. The new pope's clothes are laid out. Now it's up to the cardinals. The work to elect a successor to retired Pope Benedict XVI begins in earnest Tuesday, with a morning Mass at St. Peter's Basilica. The service - open to the public - will be the last public event featuring the 115 cardinals who will choose the new spiritual leader of the world's 1.2 billion Roman Catholics. 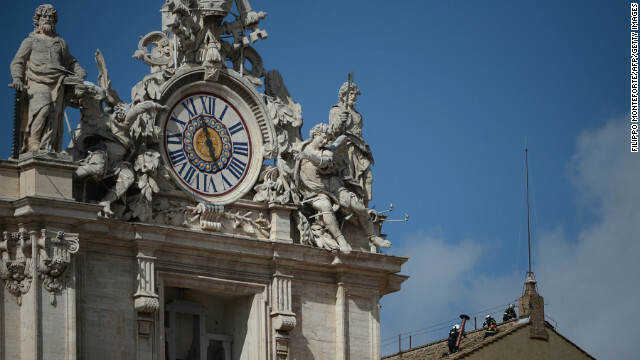 Cardinals taking part in the process will then walk to the Sistine Chapel, chanting prayers as they go, to begin the secret election called the conclave. The feast of unleavened bread shalt thou keep in the month when the ear is on the corn. Thou shalt observe the feast of weeks, even of the first fruits of the wheat harvest, and the feast of ingathering at the year's end. Thou shalt not boil a baby goat in its mother's milk. This video is garbage, don't bother viewing it. This troll is only trying to get hits for their youtube site. Click the report abuse link to get rid of this trash. "to begin the secret election called the conclave." HUGE credibility issue. Any religion that is secretive is a HUGE red flag. If they had faith in their god "choosing" the pope...it would be a lottery. Gravity wins no god(s} required or splat goes the fairy. The "prophecies" of Malachy are muddled nonsense. Next. Austin, you didn't even KNOW about that bs prophecy before it was told you on the BB...don't you think that the RCC knows about it and WON'T name the next pope Peter of Rome?? Get real. Aville Bigot is goin' nutso. Vegas syphilic is spreading her love. And disease. In conclusion, all religions dummy dum dum. Lakers good. I don't want a pickle.